Airports throughout the world are finding the rugged simplicity and long life of the American Made Pennsylvania Scale M64+ airline baggage scales ideal in the hard knock life of weighing suitcases and cargo that goes on an airplane. NTEP approved. Sizes: 18x24, 24x24 Capacity: 250, 500, or 1000 lb. 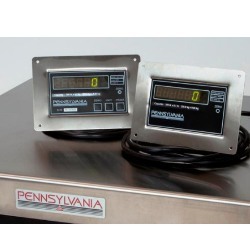 Pennsylvania Scales are widely used by municipalities, Airport Authorities, and commercial Airlines for the purpose of baggage check-in; their reputation for rugged reliability and no-nonsense support is spreading rapidly in the airport business. Major users include (but are not limited to) USAirways Pittsburgh; Miami International Airport (all terminals); Alaska Airlines; and many other installations at major airports worldwide. Package includes single or dual displays; customize with up to 4 displays and extended cable lengths; weatherproof models for Curbside Check-In and portable units for Gate applications or weighing passengers. •Package includes single or dual displays; customize with up to 4 displays and extended cable lengths; weatherproof models for Curbside Check-In and portable units for Gate applications or weighing passengers. NOW: Specify 1, 2, 3, or 4 displays with any Pennsylvania baggage scale-- ideal for situations where a single platform is shared between two check-in stations. Additional displays can be added to most existing units in the field if repurposed in another area of the terminal or installed for temporary check-in stations. This would provide a separate display-- WITH or WITHOUT buttons-- for (2) agents and (2) customer displays when shared. Choose from 3 display options at no extra cost: SS Flush Mount (standard for both Agent and Passenger side with/without buttons for ZERO/UNITS/PRINT), Desk/Wall mount ideal for behind counter on Agent side, or Minitower. Standard cable lengths of 10' can be customized as long as 40' from the main platform unit. ALSO AVAILABLE Heavy Duty PLATFORM SCALES for weighing Cargo, Cargo Containers, Pups, and other purposes such as Air Freight stations, Freight Reweigh applications, and more. The versatile 6600Floor Scale system is available in standard and custom sizes from 24 x 24" to 120 x 120" and capacities of 500 lbs to 40,000 lbs. A wide range of mounting options and accessories is available for any environment. The scales are designed for ON FLOOR, IN-FLOOR (pit) mounting or PORTABLE use. Update: The M64 Airline Baggage scale has been very successful in the marketplace-- both for long term reliability and performance. A number of the FIRST units, dating all the way back to 1991 continue in service at Pittsburgh. We have been limited by the maximum 24 x 24" platform size... up to now. With this design, the electronics package consisting of aluminum enclosure housing the + Series Main Board and Single or Dual displays is located up under the service counter. 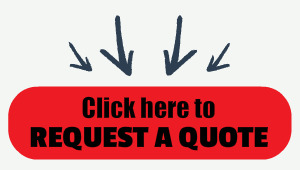 For a VERY COMPETITIVE quote on these larger platform sizes, please contact us by clicking below. REMINDER that you can purchase the M64 ELECTRONICS PACKAGE as a separate package to use with existing platforms or to upgrade existing poorly functioning electronics at a very competitive price -- either Single Display or Dual Display.